Wait! What???? It's back for Feb 15 again??? Didn't they move it to Feb 5 since the military service was shortened? I've scheduled my flight for the 1st week of Feb.
oh really sorry..I just saw it yesterday that i was only focusing on that JW is the first one to come. Don't worry. It's feb 5, 2019. I found this article. It said Feb 6. They probably skipped the Lunar New Year since it's Feb 5. I just hope it will not be moved to Feb 7 coz it's my return date. Hope It won't be delayed.. Tell us your stories when you meet JW. Have nice trip in SK. Today Lim Ji Yeon shared a picture of her with Joo Won and Shin Ju Hwan.. all of them are in same agency, Huayi Brothers. Thanks Lim Ji. Clocking out received the Best Web Drama Award at 4th Asia Rainbow TV Awards. It Is the first Korean Drama to receive an award in this category. Congratulations! I remember in a interview of KBS Entertainment Weekly, the cast talked about productions plan to make a full length movie if the response for the web drama is good. But also laughed at the fact that the cast may not be remaining same. But now that it received an award the PDs might want to continue the project ( Also JOO WON IS BEING RELEASED FROM ARMY IS A FEW Weeks)..
Anyways, I remember enjoying this web drama where Joo Won played a crazy and Maknae(after a long time) role.. Not to mention he looked sooooooo good. .. So if there's a plan for a movie (with or without Joo Won) good luck to the PDs. He's being discharged in 3 days.....Yipeee! Joo Won! One more day not caring. He's coming back!!!! tomorrow! Finally! Now I wanna see what would be his comeback drama. After he rests of course. Any idea or news? I don't know if there fans going there. Probably some Japanese fans. I've asked several fans and fanclubs but most of them have seen zoned me. I'm here in Korea now but changed my itinerary since i can't find a companion to go to the camp and the earliest bus trip going to the camp leaves at 7:30 am. I'll be probably late for the presscon by the time i'll arrive to the camp. @jongski, I think he's being careful about choosing the comeback project..I don't mind if takes his sweet time..He can leave us with his updates on vlive or other SNS in the mean time..or it'll be great if he gets invited to guest in a variety, he may share his army stories with us..Just glad he's going to be back. @kleimleyz, oh sad you're not finding any companion.. I hope you'll get to meet him without missing anything important. Let us know your stories. Have a nice trip. @flutterby06 maybe i can bump ito him after his discharge haha! Wishful thinking. 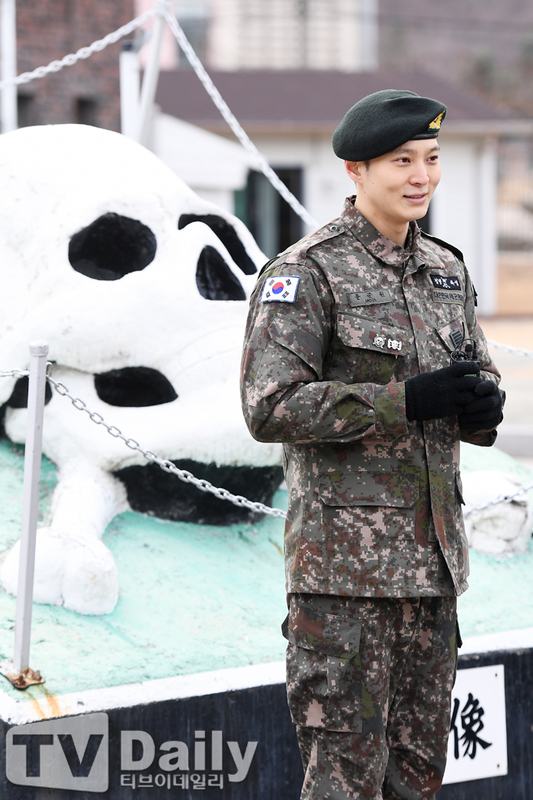 Welcome back to civilian life Joowon-shi!!!!! This is my favorite of the photos I've seen. Now, where are the casting rumors? Honestly, I kind of expected to have heard something by now. But...Blackpink?? Aw, is he "cheating" on Apink? Yee ..finally Joo Won's back. Welcome back..you've done so well. @katakwasabi good to see you here. Let's wish he comes back with Daebak Drama so that we can gush a lot like we're doing in TLE thread. Apink/BlackPink.. He still hasn't forget the "Pink" though.. I've already requested for a title change, and welcome back, actor Joo Won! Happy Seollal, Happy Chinese New Year everyone! Is it me or he seems a bit teary in those pictures? I can't wait to see him in a new production soon. Also, Thanks @airplanegirl for helping to change the forum title and @flutterby06for sharing HB's video of Joo Won! 1. [+585, -19] Before enlisting, he said at a fan meet, "When I go to the army, I'll be training with people in their early 20s but I think I'll beat all of them. I'm that healthy". He said that to calm his fans down but when God Joo Won enlisted, during the 5 week basic training, he really beat the soldiers in their 20s and he got in first place and received an award for first place at the completion ceremony ㅋㅋㅋㅋㅋㅋㅋ And he became the assistant instructor at the White Skull unit (t/n: This is a nickname for the 3rd Infantry Division), after that he became the squad commander, and was also in the special forces, I like him because he tries his hardest at everything ㅠ Congratulations to everyone who was discharged today. Happy New Year and enjoy your rice cake soup (t/n: In Korea, it's tradition to eat rice cake soup on New Years). Can't agree more with this comment..Definitely from a proud JW fan. It amazes me how he tries to give his best at everything. He shared photos of his unit. He's someone who is always loved by people around him due to his sweet nature. Seeing how he mentioned this time could be seen as long or short, he definitely had a meaningful experience there.. Thanks White Skull Division for taking care of Joo Won. This person (most probably a direct senior from White skull division) left a congratulatory message for JW with pictures. The thread title has been changed! Once his new project has been announced, I will then request for the title to be changed again. Joo Won in press conference..
With fans.. Runny nose due to cold. One question what is the mame of webdrama of him? I want to Watch it!